The New X-Men series caused a stir when it first appeared, offending as many readers as it pleased. ComicBase user and contributor Larry Robertson reviews. 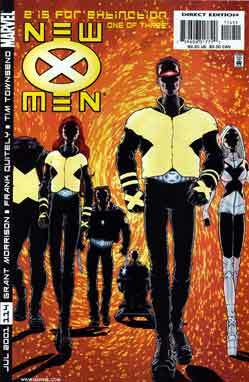 Marvel renamed the X-Men’s second series when iconoclastic writer Grant Morrison took over. The book changed in several ways and most fans either loved it or hated it. The colorful spandex was replaced with black leather uniforms. The storylines were more science-fiction than super-hero. Morrison’s run was very controversial and suffered from inconsistent artwork. One issue featured the clean lines of Frank Quitely while the next was filled with the sketchy style of Igor Kordey. Grant Morrison’s run, while artistically uneven, did introduce many new characters like Zorn, the Stepford Cuckoos, and Cassandra Nova, as well as new concepts like the “Kick” drug and an expanded number of mutants. It ended spectacularly with “Here Comes Tomorrow” storyline with art by Marc Silvestri. Larry Robertson is a frequent contributor to the ComicBase database. Visit him online at his blog at http://lrpctech.com/blog/.